This is the Zebella vintage PU leather briefcase. Zebella is not a well-known group because they only sell their stuff on third party online retailers. 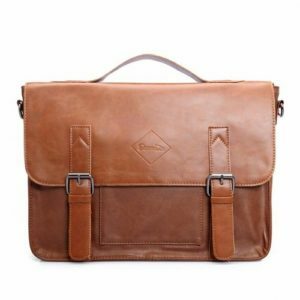 This vintage briefcase however is one of the best-selling briefcases on different online retailers so they must have done something right. The Zebella briefcase is an extraordinary piece of gear for your collection for the price but will its lower price tag mean a compromise in quality? 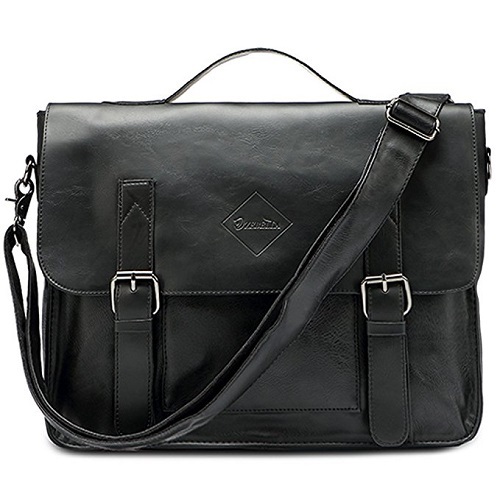 Read on below to see what I think of this briefcase by Zebella and if it’s right for you. You can also just see what’s good and what’s bad at the bottom of the review! The Zebella vintage leather briefcase is just that, vintage, and it sure does look good. The Zebella leather briefcase provides you with a professional style with a very classic look. I find myself maybe a little young for this briefcase as I think it is more suited for an older audience. Now that doesn’t mean I don’t like the look of it, because I do, but I just don’t see if being something most people under 30 would like to carry around. However, one really cool thing about the appearance is that it gives off an Indiana Jones satchel type of feeling. That’s because this briefcase comes with a strap to put over your shoulder. Lastly the look of the leather with the stainless steel buckles makes it look very genuine. The leather by the way is hard leather not soft leather which only adds to its vintage characteristics. Lastly Zebella offers the vintage PU leather briefcase in three different colors. I am reviewing the light brown model which you can see to the right. The other two colors are a dark brown and black, which honestly I think both are subpar to the light brown. 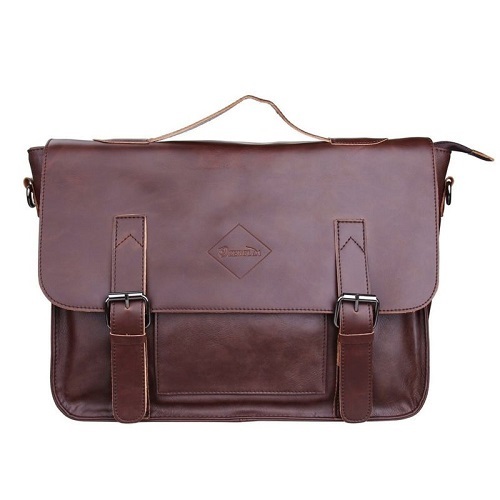 Overall the style of the Zebella vintage PU leather briefcase is very well done and I like the fact that it sticks with characteristics you would find in a truly old school leather briefcase/satchel. For these reasons I give it 5 out of 5 stars for style. There’s not a lot that can be said about the comfort of a briefcase but because you will undoubtedly be using the adjustable strap, I will cover what I can. Regardless of how long this section is. 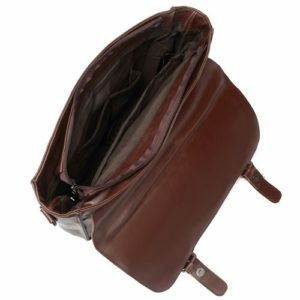 There are two points that I want to bring up with regards to comfortability for the Zebella vintage PU leather briefcase. One is that the adjustable strap, although not padded, is actually really comfortable. The reason why it’s able to remain comfortable is that it is actually thick enough, wide enough and adjustable so that it doesn’t dig into your shoulders and it distributes the weight evenly. Well done Zebella. The thing I do not like about the Zebella briefcase is that the handle seems like it’s just a cheap addition they tried to attach last minute. The handle is a very thin single layer of PU leather that is thin and just not very comfortable to carry your briefcase around with. You will only be using the shoulder strap when carrying this briefcase, I promise you that. Now that’s not the only problem with the handle but we’ll get into more of it when we talk about durability. The Zebella vintage briefcase is so so when it comes to comfortability. They do a great job with one part of the briefcase you’ll be using to carry it around and completely neglect the other. The adjustable strap is great despite not being padded and the handle is just an abomination. For this and Zebellas blatant disregard to the handle it leave me giving them 3 out of 5 stars. It would have been 2 stars but most people would only use the adjustable strap anyways. The durability of the Zebella vintage PU leather briefcase leaves a little to be desired. It’s a leather briefcase made with hard leather which is extremely durable but that’s not the problem that I had with this briefcase. If you remember in the comfortability section I was mentioning how I didn’t like the handle for numerous reasons. Well the other reason is that it’s not very sturdy and I’ve already started to see some stitching come undone after a couple months of use. One of the contributing factors to the handle starting to wear has to actually do with another feature that is troubling. In case you weren’t aware the buckled straps on this vintage leather briefcase aren’t really buckling anything down; there are magnets that close the flap down. And these magnets underneath the straps aren’t the greatest in the land. I loaded this briefcase up with lots of stuff as I do with any bag when reviewing it and the magnets had a hard time keeping the flap closed. I would be walking with it or picking it up out of the back seat and grab it by the handled only to have it fly open. The only saving grace is that underneath the flap you can zip it closed so none of your belongings go flying. The durability of the Zebella vintage PU leather briefcase is perfect up until you look at the handle/magnet situation. I know this section was mostly about the poor quality of those parts of the briefcase but let’s be honest, how often are you going to be using the handle on its own. If you want to spend a little more money and get something that will last, you should check out this durable and comfortable leather briefcase. For that reason I will give the durability of the briefcase 3 out of 5 stars. Zebella’s vinatage PU leather briefcase makes up for its low stars in durability with its functionality. It doesn’t a couple of good things here really well and we’re glad to see they pulled out of their low star rating slump. The obvious thing that we’ve already mentioned multiple times that is nice to have with this briefcase is the adjustable shoulder strap. It’s a little different from the attache briefcases many people are accustomed to but I like that about this case. It is also detachable if for some reason you would ever want to remove it with this briefcase, but the option is there for you. They’ve also implemented some organization with this briefcase as you would have expected with any well-made briefcase. They have a zippered pocket on the back side of the briefcase to store small things like documents or passports. On the interior there are two smaller pockets along the front that you can use to hold your cell phone in one and perhaps your wallet in the other. They are a nice to have and actually big enough to hold those two things. I’ve seen some where the pocket was too small to hold my cell phone with the case on it. Aside from that we have the main compartment for all of your files, folders, textbooks, notebooks, or whatever else you find you may need to carry. Right next to that is a separate compartment I assume is used for your laptop. I was able to fit my 15” Dell in there, although it was snug it worked out very well. The magnetic closures behind the buckled straps are a nice touch as it allows you to quickly access what’s inside your briefcase. It’s only good to use however with the shoulder strap where it’s not pulling against the magnets. 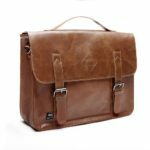 Overall the functionality of the Zebella vintage PU leather briefcase is what you would expect out of something that costs a couple hundred dollars. They do a really great job of storing and organizing your belongings and the shoulder strap and magnetic closures are a nice addition. I give this vintage leather briefcase 5 out of 5 stars for functionality. The Zebella vintage PU leather briefcase is a great bag for the price that you’re paying but not looking at the price as a factor this is just an okay briefcase then. But let’s review what was good and bad about this leather briefcase. The style of the Zebella briefcase is something you don’t see often. It has very classic but also adventuristic characteristics about it. The leather adjustable shoulder strap is amazingly comfortable considering it’s not padded. It’s wide enough to evenly distribute the weight. The briefcase is made of very very durable hard PU leather that lasts and won’t lose its shape. Zebella implemented good organization into this briefcase to allow you to store different documents, gadgets and what not in different little pockets and compartments. 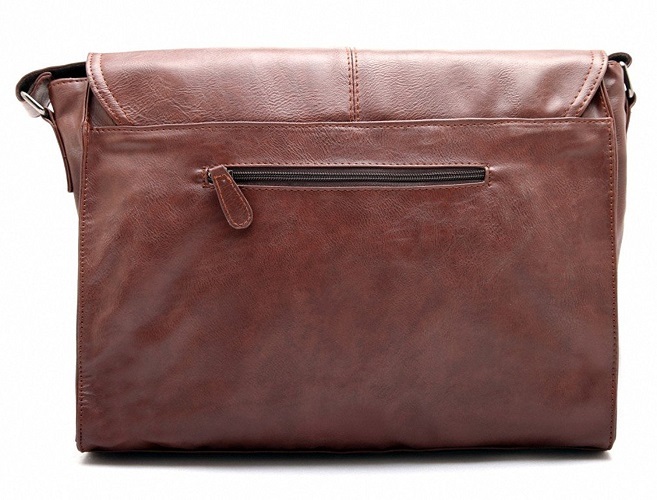 The price of this leather briefcase is unbeatable. The leather handle is very thin and not comfortable at all to use. The stitching on it has started to slowly come undone after a month of heavy use. When holding the briefcase by the handle, if the weight of the briefcase is too much, it will pop open the flap of the briefcase; luckily the main compartment can be zippered. The Zebella briefcase is the perfect briefcase for someone on a budget like a broke college graduate student or someone who doesn’t have a couple hundred dollars to spend on something similar. For the price it’s a very good bag but cheaply made. However if you can splurge a little more, I would recommend getting something of better quality. Overall the Zebella vintage PU leather briefcase gets 4 out of 5 stars. Have a comment or review of your own about the Zebella briefcase? Leave your reply below!